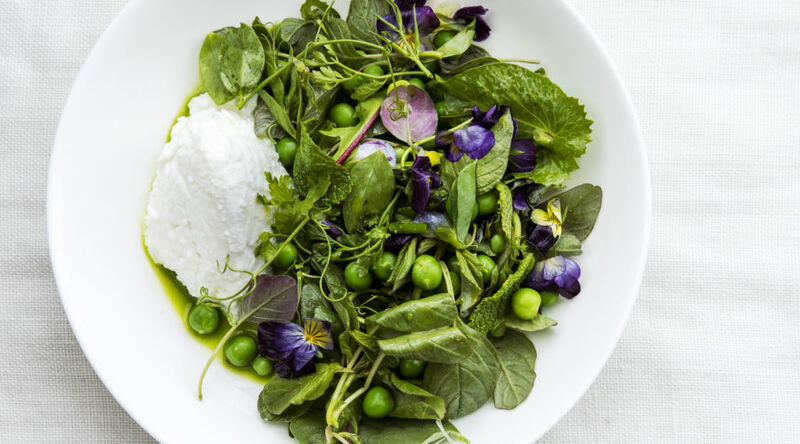 This salad, from San Francisco cookbook author and teacher Michelle McKenzie, benefits from a variety of greens: at least one sweet (pea shoots and flowers, fava greens), one peppery (watercress or peppercress), and one bitter (dandelion greens or amaranth). For the herbs, she likes a mix of mint, dill, parsley, or chervil; fennel fronds work too. Bring a large pot of water to a boil; add salt until it tastes like the sea. Set a large bowl of ice water near the stove. If using fresh peas, boil until bright green and tender, 30 seconds to 1 minute. With a slotted spoon, transfer to ice bath to cool. Drain well, spread on a kitchen towel, and pat dry. If using thawed frozen peas, dry them the same way, uncooked. To 4 to 6 large shallow bowls, add a large spoonful of ricotta on one side. In a large bowl, whisk together lemon juice, a pinch of fine sea salt, a few grinds of pepper, and 1/4 cup preserved lemon herb oil. Add peas, greens, herb leaves, chives, and another pinch of fine salt. Gently toss with clean hands. Season with more lemon juice, oil, or salt, depending on the greens used. Mound salad next to cheese. Drizzle a spoonful of extra preserved lemon herb oil around each salad so that it forms a shallow, bright green pool. Top salads with flaky sea salt and a few edible flowers, if using. Serve at once. *Shelled fresh peas are available at Trader Joe’s in handy 10-oz. packets ($3.49 each). MAKE AHEAD: Blanched peas and herb leaves, up to 1 day, chilled. Trimmed and washed greens, up to 2 days.